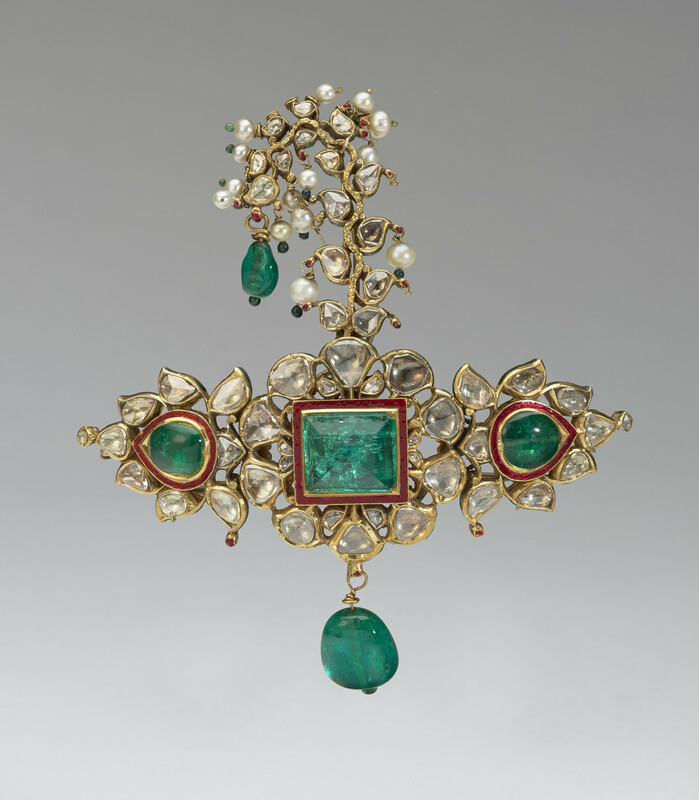 A turban ornament or sarpech comprised of emeralds and diamonds set within a gold frame, with additional emeralds and pearls suspended from it. The back of turban ornament is enamelled in red, green, white and blue with flowers and peacocks. In the late nineteenth century, turban ornaments were worn in parts of India to symbolise a ruler's royal status. The gemstones used in this example are of impressive size and many are faceted. In Indian jewellery this was usually only done to larger stones. Some of the stones used for this ornament, such as the large emerald on the right with a drill hole running through the centre, may have served other purposes in the past. This was common practice in India as the best stones in a treasury would be reset as fashions, or the whim of a ruler, changed. Like many examples of jewellery from northern parts of India, the back of this turban ornament is enamelled, which if worn, would not be easily visible. Udaipur is one of the several regions in Rajasthan for many centuries that has specialised in polychrome enamelling.